When a little white box from the little brewery in Shiner shows up at my door in the spring or summer, it's a fairly safe bet that some sort of fruit beer is in the offing. Just consider what the Spoetzl Brewery has produced during warm weather months over the past few years. Beers like Ruby Redbird, Prickly Pear and Strawberry Blonde have all hit the market once the mercury started rising in the Lone Star State. 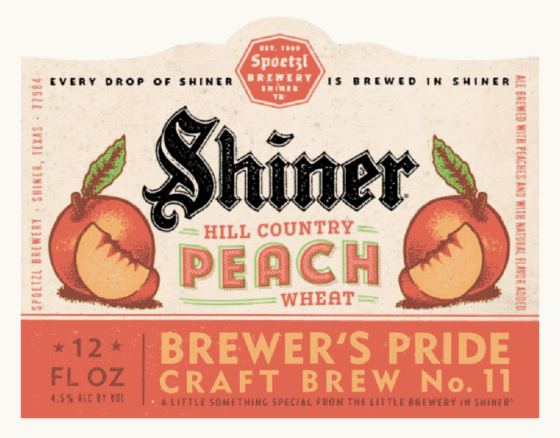 In each of those instances, the fruit used to make the beer was harvested right here in Texas, which is a trend that continues with the latest beer in Shiner's Brewer's Pride series, Hill County Peach Wheat (4.5% ABV, 15 IBU). 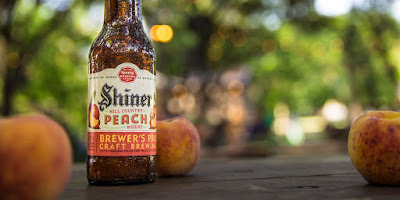 It's a beer that's brewed with a mix of 2-row and wheat malt, along with other natural flavors, but the peaches are what brings "the Hill Country to your hand." Peach Wheat makes for a fine poolside potation (The Gambrinus Co.). Now, make no mistake, Hill Country Peach Wheat is peachy, and not in a contrived way like a lot of beers that claim to feature the fuzzy fruit's flavor. It's just that other than a hint of wheat grain in the finish, peaches more or less dominate the palate. So, the question of the beer's appeal would seem to come down to whether the peach presence is too much of a good thing. On that note, my impression of Hill Country Peach Wheat follows almost directly in line with what I thought about Shiner Prickly Pear. When the beer is cold...ice cold...it's a refreshing and effervescent beverage that stops just short of the soda-like quality I sensed when drinking Ruby Redbird. Let it get too warm, though, and it feels as if the sweetness starts to linger just a little bit too long. Be that as it may, Hill Country Peach Wheat almost certainly isn't meant to be a sipping beer. Rather than setting aside time to savor a beer like this, you're more likely to shotgun it on a hot summer day. Just keep it cold and keep it koozied, if that's the case, and you'll be good to go should you decide to pop a Peach Wheat poolside. Like all Brewer's Pride release, Shiner Hill Country Peach Wheat will only be available for a limited time. Look for it on tap, in 24-ounce bombers, and in 12-ounce bottles as part of the brewery's Family Reunion six pack.